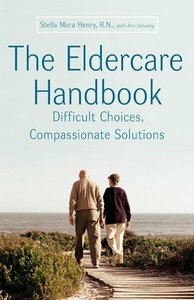 In this comprehensive and accessible guide, long-term care expert Stella Henry helps readers navigate the daunting logistics and powerful emotions of making care decisions for an elderly parent or loved one. Drawing from her 36 years as a registered nurse and a nursing home administrator, as well as her experience caring for both her parents (both of whom suffered the ravages of Alzheimer's disease), Henry tackles all the tough issues: spotting the warning signs of dementia, redefining sibling roles, doing a walk-through at an assisted living facility or nursing home, making the move, and coping with "take me home!" demands.She also explains the medical, legal, and insurance maze. In a time when almost 10 million Americans currently need long-term care, The Eldercare Handbook is an essential read.